Troi Grabber Plug-in adds video image grabbing functions to FileMaker Pro. With it you can take a picture from a video camera and put it into a container field. And it can record movies too, all from FileMaker Pro! What can Troi Grabber Plug-in do for you? open the preview in a separate and powerful image grabbing window. You can record a movie from a video input source in a separate window or even on the same FileMaker layout. Show a movie grabber window and let the user start and stop the recording by clicking on a button. You can also record for a specified number of seconds. The recorded movie is saved to a specified path on the hard disk, and inserted as a reference in the FileMaker database. And if the video source has a timecode a timecode track is also created! This is usually the case with a FireWire connection and a DV camcorder. Troi Grabber Plug-in can get timecodes of a recorded movie. In the download you find example files showing how to record and then insert a movie into a container field. The selection of where the movie must be saved is done in cooperation with the Troi File Plug-in. You can rotate the image 90, -90 or 180 degrees. With this you can not only capture images in landscape but also capture images in portrait orientation. It is possible to define a rectangle that will be super imposed on top of the image preview. This cropping rectangle enables you to visually select a part of the video image. You can grab only the part of the image that is inside the cropping rectangle or you can still grab the complete image. You can even do both at the same time! On Mac OS X you need QuickTime version 7 or higher installed and a video input source that is compatible with QuickTime. Examples of these inputs are the built-in iSight (on MacBooks), DV camera connected to a FireWire port, the video-in port on AV Macs and several web cams. On Windows you need a TWAIN compatible input source, like a video camera (Cam Corder), and installed TWAIN drivers for this input source. We are sure you can come up with some great ideas yourself! You are free and invited to test the plug-in before you pay. Troi Grabber Plug-in is fully functional in demo mode, it will only stop working after 2 hours of testing. Download your copy here. Troi Grabber Plug-in 2.3 adds support for FileMaker Pro 12 and 13, with examples in the .fmp12 format. It also adds the EasyInstallTroiPlugins.fmp12 example which demonstrates how to automatically install the plug-in directly from a container field. Fixed a bug in Grab_GrabImage and QuickTimeClassic, which could cause the grabbing an image to fail with error code $$-2020. Added new switch “-GetPluginInstallPath” to the Grab_Version function: This switch will return the path where a plug-in is installed, for example “/Mac HD/Users/User Name/Library/Application Support/FileMaker/Extensions/Troi_Grabber.fmplugin”. (in the FileMaker Pro 12 formatted download only) Added new example file EasyInstallTroiPlugins.fmp12, which contains the plug-ins and can install the plug-in from within FileMaker Pro 12. Made compatible and extensively tested with FileMaker Pro 11. Tested and made compatible with Mac OS X Lion 10.7: in our testing we have found no issues with Mac OS X Lion. Added new switch “-GetRegistrationState” to the Grab_Version function: This switch allows you to check if the plug-in is currently registered. Added new switch to the Grab_Version function: “-UnregisterPlugin”. This will remove the registration data. The plug-in will be in a unregistered state after this. See the “Temporary Register Grabber Plug-in” script in the file RegiFunc.fp7 for an example use. (Mac OS X) Fixed a bug in Grab_OpenMovieGrabWindow where the FileMaker window would not be updated until you moved the mouse. Fixed a bug in Grab_OpenMovieGrabWindow where an empty dialog title could potentially cause a crash. Added extra switches for the Grab_CropImage and the Grab_GrabImage function: “-CodecMinQuality”, “-CodecLowQuality”, “-CodecNormalQuality”, “-CodecHighQuality” and “-CodecMaxQuality”, describing the wanted quality of the image result. Fixed a bug in Grab_Initialise, which could cause the preview to be shown in the wrong window (only while running in FileMaker Pro 11v3). Improved example files, including to show the Grabber icon in dialogs. (Mac OS X) When using the Grab_CropImage function the original image name is now preserved (if the image has no name it is still set to “GrabberCroppedImage.jpg”). The image name will be used by the FileMaker application for an initial suggested filename when exporting the field contents. (Mac OS X) added extra imageName parameter to the Grab_OpenImageGrabWindow function, which allows specification of a custom image name for the returned grabbed image. This is an optional parameter. (Mac OS X) added extra imageName parameter to the Grab_GrabImage function, which allows specification of a custom image name for the returned grabbed image. This is an optional parameter. (Mac OS X) Fixed a bug in Grab_OpenImageGrabWindow and Grab_OpenMovieGrabWindow where the Grabber window would open at a random location on the screen. (Mac OS X) When using Classic QuickTime the default name of the returned image is now set to GrabberImage.jpg. (Mac OS X) Made some internal changes to the Grab_OpenImageGrabWindow and Grab_OpenMovieGrabWindow functions: the modal dialog is now run as a real Cocoa runloop. Created Windows (beta) version with TWAIN technology. Added new Grab_SetWindowPosition function to set the position of the grabber window on the screen. Added new Grab_SetWindowSize function to set the size of the grabber window. Added new switch “-ImageQuality=x.y” for the function Grab_OpenImageGrabWindow. This will set the compression factor of the saved image. 0.0 is the minimum and 1.0 is the maximum quality (0.9 is default). Improved example file RecordMovie_QTKit.fp7. Added better error handling. Also added an option to be able to save each video recording in a new record, with the movie file getting a serial number, for example myMovie12.mov. Added new switch “-GetVideoCompressionOptionsList” for the function Grab_GetDeviceInfo. This will return a list of possible compression options available for recording video when using the QTKit technology. Also added the scripts for this in the example file RecordMovie_QTKit.fp7. Improved example file GrabImage_QTKit.fp7: added a script to export all grabbed images to disk. Improved the grabbing window (QTKit): the preview will resize to the correct aspect ratio of the video device. Updated incorrect text in the file “All Grabber Examples.fp7”. Made small corrections to the example files. The plug-in is now compatible with FileMaker Pro 9 and 10 (older versions of FileMaker are not supported). Converted to the function API of FileMaker Pro 7. It is now also a Universal plug-in which runs natively on PowerPC and Intel Macs. Added a new technology: QTKit. This technology allows you to grab images and movies in a separate window. Also converted the ‘classic’ grabbing functions, to work with FileMaker 9 and 10: in this case the preview is still shown inside the window. The functions return better results, making use of the FileMaker Pro 7 API. For example the grabbed images (instead of using the clipboard) are now returned as a binary type, allowing for easy setting into a container field. Added several other new functions. Added new Grab_VersionAutoUpdate function, which is part of an emerging standard for FileMaker plug-ins of third party vendors of plug-ins. The version number is returned in the format aabbccdd where every letter represents a digit of the level, so versions can be easily compared. Added an “-EnableHighQuality” switch as 5th parameter for certain VideoGrabbers. Grab-GetTimecode now also returns a duration timecode when there is no timecode track. 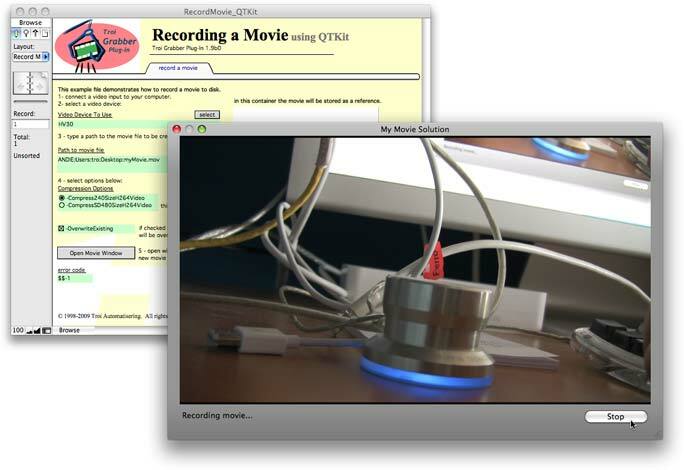 Added Grab-RecordMovie function for Mac OS and Mac OS X. Added Grab-GetTimecode function for Mac OS and Mac OS X. Fixed bug in demo file where the settings would not be stored in a global. Added Compatibility for FileMaker Pro 5. Rotate and Cropping functions (Mac Only). Fixed a bug with the centering of the image when switching from PAL to NTSC (or reverse). Improved User Guide on page 11-12. Changing screen resolution is handled properly. Grab-DoSettingsDialog now returns a proper error code when there is no preview running. Grab-Stop returns an error code 0.
sample scripts now checks for more error codes. Licenses work both on macOS and on Windows. Please contact Troi if you want to upgrade from a different license bought in the past. I just wanted to drop a line to let you know that we really appreciate you working with us on this. I’ve been using your plugins (Dialog and File) for a long, long time here at SBCNE and have always been happy with them and your service. The fact that you are willing to modify a plugin to meet current technology needs, ie Grabber in the situation we were just in, is VERY helpful to us and our clients. Matt Klein, Small Business Computers of New England, Inc.
We are still collecting more comments. If you have any remarks on the Grabber Plug-in please send us your comments. Thanks! *This plug-in will currently not run on FileMaker Pro 14 and later (64-bit). To use this plug-in with FileMaker Pro 14 please try running FileMaker Pro 14 in 32-bit mode. See the FileMaker 14 compatibility page for more info. (Older) information on how to convert databases which use Troi Grabber from FileMaker Pro 6 to FileMaker Pro 7 and later. Record pictures and movies directly with FileMaker Pro.